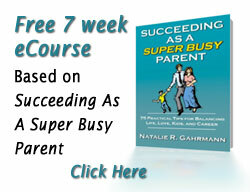 SuperBusy = an accomplished high achieving professional with a lot on her plate and the potential to succeed in multiple roles. You’re a part of a new generation of people frequently feeling busy but able and willing to embrace your multiple roles and responsibilities. You likely experience competing priorities and conflicting demands. You’re not just busy running around like a chicken without a head. You’re uniquely SuperBusy! You’re already somewhat successful and have the wherewithal to achieve greater success. Yet something is in the way! There’s a gap between where you are and where you want to be! Are your Leaders Super Busy? Are you optimizing the potential of your workforce? Are you ready to learn how to leverage personal strengths and maximize potential to accomplish more of what’s significant and meaningful?